Thank you for your interest in BP (Blood Pressure) Amp. Please complete and submit the form below and an ADInstruments representative will aim to get in touch within one working day. If you’d like to speak to someone immediately, office contact information is available from the contact page. A fully-isolated blood pressure amplifier approved for human connection. 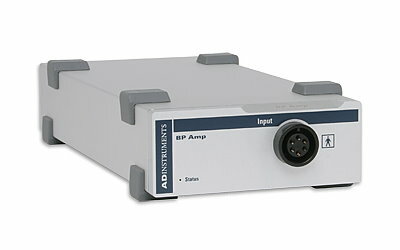 A fully-isolated blood pressure amplifier approved for human connection. The unit is preset to measure pressure (mmHg) using the supplied Disposable BP Transducer (stopcock) for humans and animals. Please Note: Although the transducer is supplied packaged, ADInstruments does not guarantee the integrity of packaging nor sterility of the transducer and therefore it MUST be gas sterilized prior to use with human subjects. Alternative types: Transducers up to 1 kΩ with ~ 5 μV/V/mmHg sensitivity with a 4-pin transducer connection cable require calibration.